Another successful Kickstarter product, now available on DriveThruRPG. Eloy Lasanta does a lot of things well, but nothing better than his wonderful Ninja Crusade game (now in its 2nd Edition). This is a rather special product, one that turns the premise on its head by letting you play heroes of the empire, facing off against the unruly, disloyal ninja! Born of loyalty and a sense of patriotism, the Izou Army isn’t made up of mindless, faceless foot soldiers. Each one is a living, breathing being fighting for what they think is right. That happens to be working toward the eradication of all ninja, putting them face-to-face with magical enemies who wield deadly forces. The Izou Army has a few tricks up it’s sleeve though. …to a victory like never before. 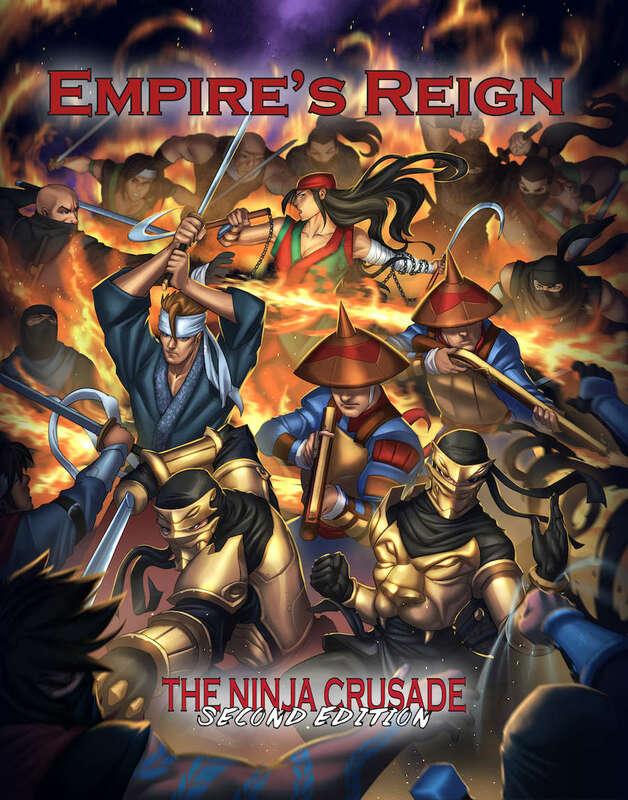 Empire’s Reign is the fourth sourcebook for The Ninja Crusade 2nd Edition and explores the secrets of the Izou Army. Learn about the Emperor’s strategic military locations, and the special units he has under his control, like the Executioners, the Silver Blades or the Iron Breakers. The war has dwindled in past years, but it the powder keg has already been lit. New Playable Options: Assignments, including Jadesmiths, Executioners and Black Smokes. 12 new Pregenerated characters ready to take on the ninja!